How to Cite This Chapter: McIvor RA, Pierzchała W, Niżankowska-Mogilnicka E, Gajewski P, Mejza F. Chronic Obstructive Pulmonary Disease. McMaster Textbook of Internal Medicine. Kraków: Medycyna Praktyczna. https://empendium.com/mcmtextbook/chapter/B31.II.3.6 Accessed April 23, 2019. Global Strategy for the Diagnosis, Management and Prevention of COPD, Global Initiative for Chronic Obstructive Lung Disease (GOLD) 2016. Available from: http://www.goldcopd.org/. According to the 2016 Global Initiative for Chronic Obstructive Lung Disease (GOLD) guideline, chronic obstructive pulmonary disease (COPD) is defined as “persistent airflow limitation that is usually progressive and associated with an enhanced chronic inflammatory response in the airways and the lung to noxious particles or gases” with the overall severity of disease increased by exacerbations and comorbidities. A rare (<1%) risk factor for COPD is hereditary alpha1-antitrypsin deficiency. Exposure to noxious particles and gases in susceptible individuals triggers chronic airway inflammation (involving macrophages, neutrophils, and CD8+ lymphocytes) and mucus hypersecretion. Inflammatory process, proteolysis (due to protease-antiprotease imbalance), and oxidative stress result in tissue damage, irreversible narrowing of the small bronchi, and destruction of the lung parenchyma. These changes in turn cause airflow limitation and lung hyperinflation, which when advanced may lead to gas exchange abnormalities, and in severe cases are followed by the development of pulmonary hypertension (due to hypoxic vasoconstriction, structural changes to the small pulmonary arteries, and loss of the pulmonary capillary bed) and cor pulmonale. Ventilation-perfusion mismatch caused by unequal ventilation and perfusion—with some alveoli being perfused but not ventilated, thus forming a nonanatomical venous shunt—leads to hypoxemia, while alveolar hypoventilation causes hypercapnia. Chronic inflammation, hypoxia, and physical inactivity cause COPD systemic effects, which include cachexia, skeletal muscle wasting, reduced bone density, anemia, and central nervous system abnormalities. COPD comorbidities (hypertension, ischemic heart disease, stroke, diabetes mellitus, anxiety, and depression) have adverse effects on the patient’s health status and prognosis. COPD increases the risk of lung cancer. The most frequent causes of exacerbations of COPD are respiratory tract infections (usually viral or bacterial), air pollution (eg, dusts, nitrogen dioxide, sulfur dioxide), or discontinuation of long-term treatment. COPD is a progressive disease, particularly in the case of sustained exposure to noxious agents (mainly to cigarette smoke). It may have a variable course. The prevailing majority of patients have a multiple-year history of tobacco smoking. 1. Symptoms: Chronic cough that may be periodic or daily, frequently lasting the whole day, and in rare cases present exclusively at night; chronic sputum production, most profuse after awakening; dyspnea, which is exertional in the early stages of the disease and becomes more severe with time, leading to resting dyspnea in patients with severe disease. Unlike in asthma, the symptoms are usually characterized by low diurnal and day-to-day variation. Patients with severe COPD may complain of fatigue, anorexia, and weight loss, as well as depressed mood (or other symptoms of depression/anxiety). 2. Signs depend on the severity of the disease (in early COPD physical examination is normal, particularly when the patient is breathing quietly) as well as on the dominant role of the symptoms of bronchitis (wheezing, rhonchi) or of emphysema (patients with advanced emphysema may have an increased antero-posterior diameter of the chest [sometimes barrel chest], impaired diaphragmatic motion during respirations, hyperresonance on percussion, diminished breath sounds, prolonged expiratory phase—particularly at forced expiration). In patients with severe COPD, use of accessory muscles of ventilation, intercostal retractions during inspiration, “pursed-lip” breathing, and sometimes central cyanosis may be present; patients with decompensated cor pulmonale reveal signs and symptoms of chronic right ventricular failure (see Chronic Heart Failure); and patients with more advanced disease may develop cachexia, skeletal muscle wasting, and depression. Patients with a low respiratory drive (“blue bloaters”) feel less shortness of breath and have good exercise tolerance despite hypoxemia. In patients with high respiratory drive (“pink puffers”), blood gases are within normal limits due to hyperventilation at the cost of high respiratory effort, constant feeling of shortness of breath, and poor exercise tolerance. 3. Exacerbation: Acute worsening of the respiratory symptoms (dyspnea, sputum volume and/or purulence) that is beyond the usual day-to-day variations. 1) Spirometry: According to the 2016 GOLD guideline, a postbronchodilator (eg, albuterol 400 microg) ratio of forced expiratory volume in 1 second (FEV1) to forced vital capacity (FVC) that is <0.7 confirms the diagnosis of COPD. The severity of airway obstruction is classified on the basis of postbronchodilator FEV1 (mild [GOLD 1], ≥80% of the predicted value; moderate [GOLD 2], ≥50% to <80% of the predicted value; severe [GOLD 3], ≥30% to <50% of the predicted value; very severe [GOLD 4], <30% of the predicted value). Do not perform routine spirometry in patients with exacerbations of COPD because the results are unreliable. 2) Body plethysmography, which may reveal increased residual volume (RV), functional reserve capacity (FRC), and total lung capacity (TLC), as well as an increased RV/TLC ratio in the case of hyperinflation and emphysema. 3) Diffusing capacity of the lungs for carbon monoxide (DLCO), which is useful in patients with dyspnea disproportionate to the severity of airway obstruction. In patients with advanced emphysema, DLCO is reduced. a) Walking tests (6-minute walk test, shuttle walking test). b) A cardiopulmonary exercise test using a cycloergometer or treadmill. c) Monitoring everyday activity with accelerometers or other devices. 2. Imaging studies: Chest radiographs reveal a flattened and depressed diaphragm, increased antero-posterior chest diameter and retrosternal space, and hyperlucency of the lungs. In patients with pulmonary hypertension, reduced or absent vascular markings in the peripheral areas of the lungs and dilation of pulmonary arteries and the right ventricle are observed. High-resolution computed tomography (HRCT) is helpful in the case of diagnostic difficulties, as it allows for differentiation between various types of emphysema, assessment of its severity and location, and diagnosis of coexisting bronchiectasis. 3. Pulse oximetry and arterial blood gas measurements are performed to estimate the severity of COPD exacerbations, in chronic respiratory failure, and to monitor the safety of oxygen therapy (risk of increasing hypercapnia). 4. Sputum cultures (or tracheal aspirate cultures in intubated patients) are performed in patients with severe or prolonged exacerbations and an increased sputum volume or purulence. 1) Complete blood count (CBC): Polycythemia (hematocrit often >55%) in patients with hypoxemia or normocytic normochromic anemia (anemia of chronic disease). 2) Electrocardiography (ECG), echocardiography: Features of cor pulmonale. 3) Tests for alpha1-antitrypsin deficiency in patients <45 years of age, particularly nonsmokers or those with a family history significantly suggestive of the deficiency. COPD should be suspected in every patient who presents with (1) persistent dyspnea; (2) chronic cough; (3) chronic sputum production; and/or (4) exposure to risk factors for COPD. According to the 2016 GOLD guideline, a postbronchodilator FEV1/FVC ratio <0.7 confirms the diagnosis of COPD (see Diagnostic Tests, above). 1) Assessment of the current severity of symptoms using the COPD Assessment Test (CAT) (catestonline.org; scores ≥10 indicate severe symptoms) or the clinical COPD questionnaire (CCQ) (scores ≥10 indicate severe symptoms). The modified Medical Research Council (mMRC) dyspnea scale can also be used (see Dyspnea) but includes only assessment of dyspnea (grades ≥2 indicate severe dyspnea). 2) Worsening of spirometric parameters of airflow limitation (based on FEV1). a) Spirometric categories (see Diagnostic Tests, above; GOLD 1 and 2, low risk; GOLD 3 and 4, high risk). b) The number and severity of exacerbations in the prior 12 months (<2 exacerbations, low risk; ≥2 exacerbations, high risk). c) Hospitalization due to exacerbation in the last 12 months (hospitalization is associated with high risk). In case of discrepancies in risk assessment using these methods, select the method that reveals a higher risk. On the basis of symptoms, spirometric abnormalities, and the risk of exacerbations, 4 groups of patients with COPD—A, B, C, and D—can be identified: Figure 1. Asthma (Table 1), bronchiectasis, left ventricular failure, tuberculosis, lung cancer, and other causes of chronic cough (see Cough); rarely, obliterative bronchiolitis, airway tumor, a foreign body in the airway, pulmonary hypertension, and tracheobronchomalacia. Differential diagnosis of COPD exacerbations includes pulmonary embolism, pneumothorax, left ventricular failure, worsening of bronchiectasis or exacerbation of asthma, and lower respiratory tract infection. 1. Definitive smoking cessation as well as avoidance of passive smoking and exposure to outdoor and indoor air pollution. At each visit, patients should be advised to quit smoking and offered assistance in obtaining counseling or starting pharmacotherapy (see Nicotine Addiction).Evidence 1Strong recommendation (benefits clearly outweigh downsides; right action for all or almost all patients). High Quality of Evidence (high confidence that we know true effects of the intervention). Quality of Evidence judged high despite the observational nature of data due to the very strong effect of smoking cessation. Doll R, Peto R, Boreham J, Sutherland I. Mortality in relation to smoking: 50 years’ observations on male British doctors. BMJ. 2004 Jun 26;328(7455):1519. Epub 2004 Jun 22. PubMed PMID: 15213107; PubMed Central PMCID: PMC437139. 2. Influenza vaccination (all patients) and pneumococcal vaccination (patients ≥65 years and younger patients with severe comorbidities, eg, heart disease). 3. Exercise is recommended in all grades of COPD. 4. Rehabilitation: In all patients with shortness of breath when walking at their own pace on the level.Evidence 2Strong recommendation (benefits clearly outweigh downsides; right action for all or almost all patients). Moderate Quality of Evidence (moderate confidence that we know true effects of the intervention). Quality of Evidence lowered due to the inability to blind and unclear concealment. McCarthy B, Casey D, Devane D, Murphy K, Murphy E, Lacasse Y. Pulmonary rehabilitation for chronic obstructive pulmonary disease. Cochrane Database Syst Rev. 2015 Feb 23;2:CD003793. doi: 10.1002/14651858.CD003793.pub3. Review. PubMed PMID: 25705944. To be effective, rehabilitation should be continued for ≥4 weeks. Comprehensive rehabilitation programs include pulmonary rehabilitation, respiratory exercises, general exercise training, education of patients and their family/caregivers, smoking cessation programs, psychological support, psychosocial interventions, and nutrition counseling. 5. Treatment of patients with coexisting bronchiectasis is essentially similar, but during exacerbations they may need a more aggressive and prolonged antibiotic therapy. The choice of treatment depends on the severity of symptoms, spirometric category, and risk of exacerbation (Figure 1). The patient’s preferences should also be considered. 1. Bronchodilators are the mainstay of symptomatic treatment of COPD. They are administered either as needed or on a regular basis. The choice of individual agents depends, among others, on the individual patient’s response to treatment and comorbidities, particularly cardiovascular disease. a) Long-acting beta2-agonists (LABAs): Formoterol and salmeterol (duration of action ~12 hours, agents and dosage: Table 2 in Asthma), indacaterol (75, 150, or 300 microg once daily, duration of action 24 hours); vilanterol (22 microg once daily, duration of action ~24 hours, available only as a combination product with fluticasone furoate). b) Short-acting beta2-agonists (SABAs): Fenoterol and albuterol (INN salbutamol) (duration of action 4-6 hours). Agents and dosage: Table 2 in Asthma. a) Long-acting muscarinic antagonists (LAMAs): Tiotropium (dry powder inhaler [DPI], 18 microg once daily); glycopyrronium bromide (44 microg once daily), umeclidinium bromide (55 microg once daily, duration of action 24 hours); aclidinium bromide (322 microg bid, duration of action ~12 hours). LABA + LAMA combination products: Indacaterol + glycopyrronium bromide (85 + 43 microg once daily), vilanterol + umeclidinium bromide (22 + 55 microg once daily). In comparison with LABAs, tiotropium results in similar or improved outcomes and may be the preferred agent for the initial monotherapy,Evidence 3Weak recommendation (benefits likely outweigh downsides, but the balance is close or uncertain; an alternative course of action may be better for some patients). Moderate Quality of Evidence (moderate confidence that we know true effects of the intervention). Quality of Evidence lowered due to the heterogeneity of findings among different long-acting beta2-agonists on the health-related quality of life. Chong J, Karner C, Poole P. Tiotropium versus long-acting beta-agonists for stable chronic obstructive pulmonary disease. Cochrane Database Syst Rev. 2012 Sep 12;9:CD009157. doi: 10.1002/14651858.CD009157.pub2. Review. PubMed PMID: 22972134. although a combination of an ICS and a LABA may provide a better quality of life improvement than the use of a LAMA alone.Evidence 4Moderate Quality of Evidence (moderate confidence that we know true effects of the intervention). Quality of Evidence lowered due to the imprecision from network meta-analysis and lack of the inhaled glucocorticoids + long-acting muscarinic antagonists group. Kew KM, Dias S, Cates CJ. Long-acting inhaled therapy (beta-agonists, anticholinergics and steroids) for COPD: a network meta-analysis. Cochrane Database Syst Rev. 2014 Mar 26;3:CD010844. doi: 10.1002/14651858.CD010844.pub2. Review. PubMed PMID: 24671923.
b) Short-acting muscarinic antagonists (SAMAs): Ipratropium bromide (duration of action 6-8 hours; metered-dose inhaler [MDI] 20 microg/dose, 2-4 doses qid; solution for nebulization 0.25 mg/mL, 0.5-2 mL tid or qid). SABA + SAMA combination products: Fenoterol + ipratropium (MDI 50 + 20 microg/dose, 1-2 doses tid or qid; solution for nebulization 0.5 + 0.25 mg/mL, 1-2 mL tid or qid, as needed up to 4 mL), albuterol + ipratropium (solution for nebulization 2.5 + 0.5 mg/vial, 1 vial tid or qid). 3) Extended-release theophylline: Dosage: 150 to 375 mg bid. This is a second-line therapy due to its lower efficacy compared with that of the inhaled agents as well as due to adverse effects (at daily doses ≥10 mg/kg) that include nausea and vomiting, tachycardia, arrhythmias, and seizures. Prevention of adverse effects involves monitoring of serum theophylline levels to maintain them in the range from 5 to 15 microg/mL. Metabolism of theophylline is induced—which means the dose should be increased—by fever, pregnancy, smoking, rifampin (INN rifampicin), and antiepileptic drugs; and it is inhibited—the dose should be decreased—by liver disease, heart failure, quinolones, macrolides, and cimetidine. 2. 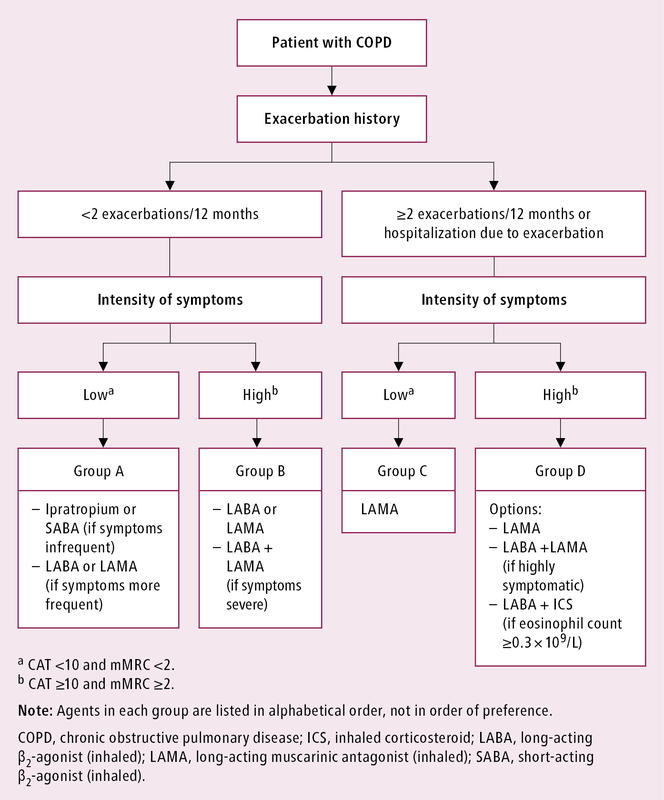 ICSs (medium- or high-dose: Table 2 in Asthma) are indicated for the prevention of exacerbations in high-risk patients with COPD (groups C and D). In patients with FEV1 <60% of the predicted value, ICSs also reduce symptoms, increase lung function, and increase the quality of life. The use of ICSs increases the risk of pneumonia. Do not use ICS monotherapy or long-term systemic corticosteroid treatment. 3. Roflumilast is a phosphodiesterase-4 (PDE-4) inhibitor; it may be considered as an add-on therapy (500 mg once daily) to the 1 or 2 inhaled bronchodilators in group C or D patients with symptoms of chronic bronchitis. Do not use roflumilast in patients who are underweight or treated with theophylline. 1) In young patients with confirmed alpha1-antitrypsin deficiency, consider alpha1-antitrypsin augmentation therapy. 2) Morphine to control dyspnea in patients receiving palliative care ([Table 3 in Dyspnea]). 3) Mucolytics: Avoid long-term use (except in selected patients with viscous bronchial secretions). In patients with moderate-to-severe COPD, ≥2 exacerbations in the last 2 years, and not treated with ICSs, the use of carbocysteine or N-acetylcysteine may reduce the frequency of exacerbations. Use of antioxidants and respiratory stimulants is not recommended. Antitussives are contraindicated. 4) Vitamin D supplementation is used only in patients with documented deficiency (blood vitamin D concentration <50 nmol/L). 5) Azithromycin: To be considered in patients with moderate-to-severe COPD with ≥1 moderate or severe COPD exacerbations in the last year (this is used with the aim of reducing COPD exacerbations). 1) Partial pressure of oxygen in arterial blood (PaO2) ≤55 mm Hg or hemoglobin oxygen saturation in arterial blood (SaO2) ≤88%. 2) PaO2 56 to 60 mm Hg or SaO2 ~88% and symptoms of pulmonary hypertension, peripheral edema suggestive of congestive heart failure, or hematocrit >55%. The target values are PaO2 ≥60 mm Hg or SaO2 ≥90%. The decision to use home oxygen therapy should be based on PaO2 values confirmed twice over a 3-week period in a clinically stable awake patient. Principles of oxygen therapy: see Oxygen Therapy. In patients with very severe COPD (group D), and particularly those with significant daytime hypercapnia despite optimal pharmacotherapy, consider noninvasive ventilation (NIV) combined with home oxygen therapy. NIV parameters should be adjusted to decrease partial pressure of carbon dioxide in arterial blood (PaCO2) by ≥20%. In patients with coexisting obstructive sleep apnea syndrome, consider ventilatory support with continuous positive airway pressure (CPAP). 1. Removal of large bullae (bullectomy): Consider this if the bulla extends over ≥50% of the lung volume and causes evident compression of the adjacent pulmonary parenchyma. 2. Lung volume reduction surgery (LVRS) may be considered in patients with FEV1 >20% of the predicted value and emphysema that involves mainly upper lobes or in patients with low physical capacity after preoperative rehabilitation and homogenously distributed emphysema. 1) History of exacerbation with acute hypercapnia (PaCO2 >50 mm Hg). 2) Pulmonary hypertension and/or cor pulmonale despite oxygen therapy. 3) FEV1 <20% of the predicted value and DLCO <20% of the predicted value or homogeneous distribution of emphysema. Palliative care is aimed at improving the quality of life and daily functioning in terminally ill patients with severe COPD. It also includes spiritual support and end-of-life care decisions. Medical history: Ask about duration of worsening or new symptoms, severity of airflow limitation (based on previous examinations), history of exacerbations (including hospitalizations and mechanical ventilation), comorbidities, as well as treatment used and any recent treatment modifications. 1. Indications for diagnostic or therapeutic hospital admission: Severe COPD or history of frequent exacerbations, significant worsening of symptoms (eg, rapid onset of resting dyspnea), alarming signs (eg, cyanosis, peripheral edema), no improvement with first-line treatment, severe comorbidities (eg, heart failure or onset of arrhythmia), uncertain diagnosis, advanced age, inadequate home care. Other patients can be treated at home. 1) Respiratory arrest or irregular respirations. 2) Severe dyspnea (particularly when associated with evident involvement of accessory muscles of respiration and paradoxical motion of the abdominal wall or tachypnea >35 breaths/min) with a poor response to initial acute treatment and NIV. 3) Altered mental status (confusion, somnolence, coma, agitation). 4) Persistent/worsening hypoxemia (PaO2 <40 mm Hg), severe/worsening hypercapnia (PaCO2 >60 mm Hg), or severe/worsening respiratory acidosis (pH <7.25) despite oxygen therapy and NIV. 5) Unavailability or intolerance of NIV. 6) Hemodynamic instability (need for vasoconstrictor use, bradycardia <50 beats/min with altered mental status). 7) Other severe complications (metabolic disturbances, sepsis, severe pneumonia, high-risk pulmonary embolism, barotrauma, pneumothorax, large pleural effusions, massive aspiration). 8) Inadequate supervision and expertise with the use of NIV in a non-ICU setting. In hospitalized patients: Arterial blood gases, CBC, electrolyte levels, renal and liver function tests, ECG, chest radiographs. Microbiology of sputum (or tracheal aspirates in intubated patients) in the case of (1) an infectious exacerbation not responding to initial antimicrobial therapy; (2) a severe exacerbation or risk factors for nonresponse to empirical antimicrobial therapy (prior treatment with antibiotics or oral corticosteroids, >4 exacerbations in the previous year, FEV1 <30% of the predicted value, protracted exacerbation). Do not perform spirometry in patients with a COPD exacerbation. In patients treated at home, pulse oximetry is usually sufficient for SaO2 measurements. 1. SABA (see above): Up to 8 doses via an MDI with a spacer device every 1 to 2 hours or nebulized (eg, albuterol 2.5-5 mg every 4-6 hours). Drug doses and frequency of administration depend on the patient’s response to treatment. In addition, you may use ipratropium bromide (2-8 doses via an MDI with a spacer device or 0.25-0.5 mg nebulized qid). Beta2-agonists and anticholinergics may be used in the form of a fixed combination (fenoterol + ipratropium) with administration of up to 8 doses via an MDI with a spacer device or 1 to 2.5 mL nebulized qid. IV theophylline is a second-line drug: administer 3 mg/kg in an injection followed by an infusion of 0.5 mg/kg/h (up to a maximum total dose of 750 mg/d). 2. CorticosteroidsEvidence 5Strong recommendation (benefits clearly outweigh downsides; right action for all or almost all patients). High Quality of Evidence (high confidence that we know true effects of the intervention). Walters JA, Tan DJ, White CJ, Gibson PG, Wood-Baker R, Walters EH. Systemic corticosteroids for acute exacerbations of chronic obstructive pulmonary disease. Cochrane Database Syst Rev. 2014 Sep 1;9:CD001288. doi:10.1002/14651858.CD001288.pub4. Review. PubMed PMID: 25178099.: A reasonable regimen may consists of oral prednisone 40 mg/d (in patients unable to take oral medications, administer IV hydrocortisone 100 mg every 6-8 hours or methylprednisolone 40 mg/d) for 5 to 7 days rather than longer,Evidence 6Weak recommendation (benefits likely outweigh downsides, but the balance is close or uncertain; an alternative course of action may be better for some patients). Moderate Quality of Evidence (moderate confidence that we know true effects of the intervention). Quality of Evidence lowered due to imprecision. Walters JA, Tan DJ, White CJ, Wood-Baker R. Different durations of corticosteroid therapy for exacerbations of chronic obstructive pulmonary disease. Cochrane Database Syst Rev. 2014 Dec 10;12:CD006897. doi:10.1002/14651858.CD006897.pub3. Review. PubMed PMID: 25491891. even in patients with severe or very severe disease. Alternatively, use nebulized budesonide 2 mg qid. 3. Antibiotics: Usually a 5- to 10-day course is indicated in patients with suspected bacterial infection, that is, when the sputum becomes more purulent, its production increases, and/or dyspnea increases as well, and in patients receiving ventilatory support (invasive or noninvasive). Measurements of procalcitonin levels may be helpful when considering the need for antimicrobial therapy; it is safe to use no antimicrobial therapy in patients with procalcitonin levels <0.25 microg/L, but in such cases the measurement must be repeated after 6 to 24 hours. The most frequent etiologic factors are Haemophilus influenzae, Streptococcus pneumoniae, and Moraxella catarrhalis. a) And no risk factors for worsening of exacerbation (severe COPD, serious comorbidities, frequent exacerbations [>3 per year], prior antimicrobial therapy within 3 months), use amoxicillin (first-choice antimicrobial agent). b) In other patients, use amoxicillin + clavulanic acid (2 g/d). c) In patients with penicillin hypersensitivity, use macrolides. d) Second-line antimicrobial agents: Fluoroquinolones with antistreptococcal activity (levofloxacin, moxifloxacin) or second- or third-generation cephalosporins. a) If oral treatment is possible, use oral ciprofloxacin. b) If parenteral treatment is necessary, use parenteral ciprofloxacin or beta-lactams active against P aeruginosa (eg, ceftazidime, cefepime). See also treatment of pneumonia. 1. 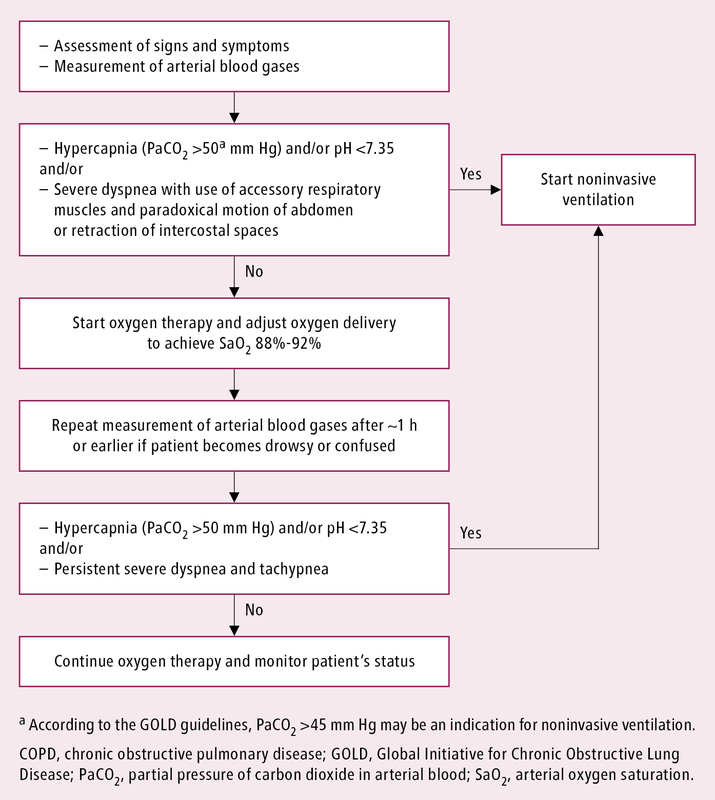 Patients with respiratory failure should receive oxygen therapy (Figure 2). In patients receiving optimal pharmacologic treatment and oxygen therapy who develop acidosis (pH ≤7.35) and/or increasing hypercapnia (PaCO2 >45 mm Hg) or who have persistent dyspnea (particularly if severe, with involvement of accessory muscles of respiration and paradoxical motion of the abdominal wall or tachypnea >35 breaths/min), use ventilatory support, unless not indicated due to end-stage disease. Use NIV whenever possible; in other cases, intubate the patient and continue ventilatory support. 1) Appropriate hydration (with strict monitoring of fluid balance). 3) Antithrombotic prophylaxis (see Primary Prevention of Venous Thromboembolism). 4) Procedures facilitating evacuation of airway secretions (by cough stimulation and forced small-volume expirations). In patients who produce copious amounts of sputum or have lobar atelectasis, manual or mechanical chest percussion and postural drainage may be effective (see Postural Bronchial Drainage). In patients with atelectasis, perform therapeutic bronchoscopy. 1. The patient (or caregiver) is able to appropriately administer prescribed medications. 2. The patient requires inhaled SABA administration not more frequently than every 4 hours. 3. The patient, who could walk before the admission, is currently able to walk around the room. 4. The patient can eat and sleep without frequently waking up due to dyspnea. 5. The patient’s clinical condition (including blood gases) has been stable over the prior 12 to 24 hours. 1) Estimation of the severity of symptoms (the CAT or mMRC scale can be used). 2) Assessment of the patient’s ability to manage in the community, exercise, and perform daily activities. 4) Assessment of drug inhalation techniques. 5) Assessment of the patient’s understanding of prescribed treatment. 6) Assessment of the need for long-term oxygen therapy or use of nebulized medications at home. In patients who develop hypoxemia during exacerbations, arterial blood gases or pulse oximetry (or both) should be performed before and 3 months after hospital discharge. Pulmonary hypertension and right ventricular failure, secondary polycythemia, anemia of chronic disease, cachexia, venous thromboembolism, depression, and anxiety. See also complications of chronic respiratory failure. COPD increases the risk of perioperative complications. It can be minimized by achieving optimal lung function before surgery, early mobilization after the procedure, pulmonary physiotherapy, and effective treatment of pain. Lung function tests are required only before chest or cardiac surgery, but in patients with more severe COPD they are also indicated prior to other types of surgery. Patients with FEV1 <30% of the predicted value or requiring long-term oxygen therapy should consult a pulmonary medicine specialist before the flight. During air travel, patients receiving long-term oxygen therapy should have oxygen administered via nasal prongs to maintain SaO2 >85% (2-4 L/min). Most airlines provide oxygen on request, but this must be booked in advance. Prognosis can be improved mainly by smoking cessation. COPD exacerbations increase the risk of death. The main causes of death are cardiovascular disease, lung cancer, and respiratory failure. The most effective method of COPD prevention is nonsmoking. However, avoidance of exposure to air pollution and other risk factors is also important. How to use the table: Shaded columns list features that, when present, best distinguish between asthma and COPD. For a patient, count the number of “YES” answers in each column. If 3 or more “YES” answers were provided for either asthma or COPD, that diagnosis is suggested. If there are similar numbers of “YES” answers in each column, the diagnosis of ACOS should be considered. Source: Global Strategy for the Diagnosis, Management and Prevention of COPD, Global Initiative for Chronic Obstructive Lung Disease (GOLD) 2016. Available from: www.goldcopd.org. 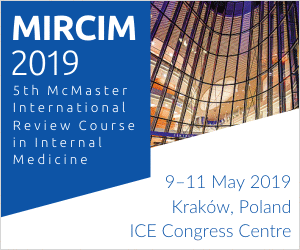 ACOS, asthma–COPD overlap syndrome; AHR, airway hyperresponsiveness; BD, bronchodilator; COPD, chronic obstructive pulmonary disease; FEV1, forced expiratory volume in 1 second; FVC, forced vital capacity; GOLD, Global Initiative for Obstructive Disease; ICS, inhaled corticosteroid. Figure 1. Classification of patients with chronic obstructive pulmonary disease and proposed initial pharmacologic treatment. Figure 2. Oxygen therapy in chronic obstructive pulmonary disease exacerbations.